One of the most disturbing cases of animal abuse that I’m aware of was that of Puppy Doe, a young Pit Bull who was given away by her original owners when their landlord decided to ban the breed due to high insurance rates. Puppy Doe, also known as Kiya, eventually ended up with Radoslaw Czerkawski, a Polish national living illegally in the U.S. on an expired work visa. Czerkawski starved the puppy and inflicted upon her what a veterinarian described as medieval-style torture. This monster systematically pulled her joints apart one by one, split her tongue in half, stabbed her in the eye and burned her. When the 95-year-old woman he was living with and a caregiver for died in August 2013, Czerkawski dumped the puppy in a wooded area. When a good Samaritan found Puppy Doe, she thought the dog had been hit by a car due to the severity of her injuries. Tragically, Puppy Doe had to be euthanized, but during her final hours she was shown what it’s like to be loved by the caring staff of the Animal Rescue League of Boston. Czerkawski was arrested after Puppy Doe’s blood splatter was found in the elderly woman’s home. His cell phone records indicated he had bought the dog from her second owner via a Craigslist ad. He was charged with 12 counts of animal cruelty, and he was later convicted of a larceny charge for stealing more than $130,000 from the elderly woman. The animal cruelty trial was originally set for early 2015, but it was repeatedly postponed. Finally, nearly five years after Puppy Doe’s horrific ordeal, Czerkawski’s trial began earlier this month in Dedham, Mass. 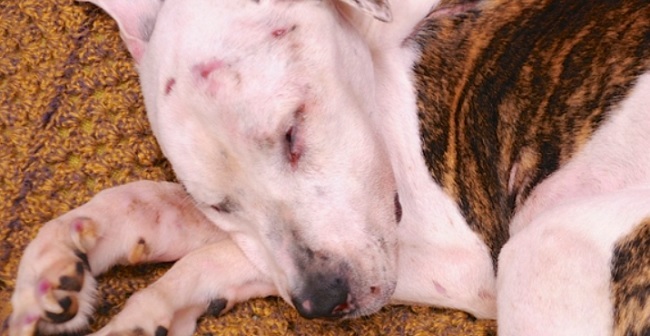 And, finally, there is some justice for Puppy Doe: This week the jury found Czerkawski guilty of all 12 counts of animal cruelty. Although the judge could have sentenced Czerkawski to 55 years in prison, he was sentenced to only eight to 10 years, followed by two years of probation. Also, Czerkawski cannot ever own, care for, or come in contact with any animal, or volunteer where animals are present. Thanks to poor Puppy Doe, animal cruelty laws have been strengthened in Massachusetts since Czerkawski was arrested back in 2013. The maximum sentence for a first offense, which used to be five years, increased to seven years. Subsequent offenses have a maximum sentence of 10 years. The fines were raised from $2,500 for a first offense to $5,000, and up to $10,000 for subsequent offenses. While eight to 10 years doesn’t seem like nearly long enough for what that despicable monster did to Puppy Doe, at least her case will hopefully prevent other animals from suffering so much cruelty.